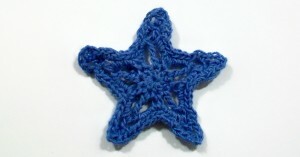 Joined with itself or other motifs, this delicate star will look lovely in a finished piece. It also makes a great accent for apparel and accessories and can even stand alone as a piece of jewelry or a bookmark. This entry was posted on Tuesday, April 16th, 2013 at 12:00 AM by Candace	and is filed under Free Crochet Patterns. You can follow any responses to this entry through the RSS 2.0 feed. You can skip to the end and leave a response. Pinging is currently not allowed. Thanks for this pattern. I’m making barefoot sandals for the 4th of July. You know, I just got an Idea. I’m going to make tons of motif’s and put them all in a nice box. and use them whenever I need to. Every one of these motif’s are the most beautiful I ever seen. I’m just thrilled with crochet spot.